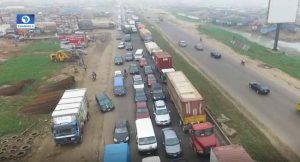 The Ogun State government has commenced the enforcement of the 70 metres setback along the Lagos Ibadan expressway, with the evacuation of illegal structures and shanties around the Kara market. Leading men and officers of the state ministries of Urban and Planning and Ministry of Environment, the commissioners in charge of the ministries maintained that the decision was necessary in order to restore sanity back to the area. “Over and over again, there have been serious incursion on the natural setback that our roads suppose to have. For example, the Federal Government has 45 metres while the state has 25 metres setback which is 70 metres from the median but consistently, this has been violated. If you have observed, this road, you see disused vehicles, shanties and illegal structures just like there are no rules and regulations. “We are embarking on this essentially to restore sanity on this road and this whole areas. It is not limited here. We will keep going down. “This is the continuation of the Urban Renewal Programme of the administration particularly at this border town in Isheri. “If you you remember we were here last year for what we tagged Operation Green Ogun. So, it is the continuation of that programme which is aimed at reclaiming the setback and bringing some sense of order to the chaotic situation we are having here,” the commissioner for environment said. As a result of this and the need to enforce a better environment, as an emerging economy, the government is embarking on the reclamation of the 70 metre setback, insisting that it would punish persons that violate the law. “When it is absolutely necessary, we will not hesitate to shut down any erring organisation that contravene and encourage this bad behaviour. So, as we go along, if there is a need to make arrest, we will do so. “About five minutes ago, you saw the leadership of the Kara market discussing with us. They are cooperating with us,” she added. The southwest Nigerian state is the gateway to many parts of the country and the Lagos-Ibadan expressway remains the entry point to the state. Over time, this axis has continued to witness uncontrolled development with shanties and illegal structures taking compulsory up setback.